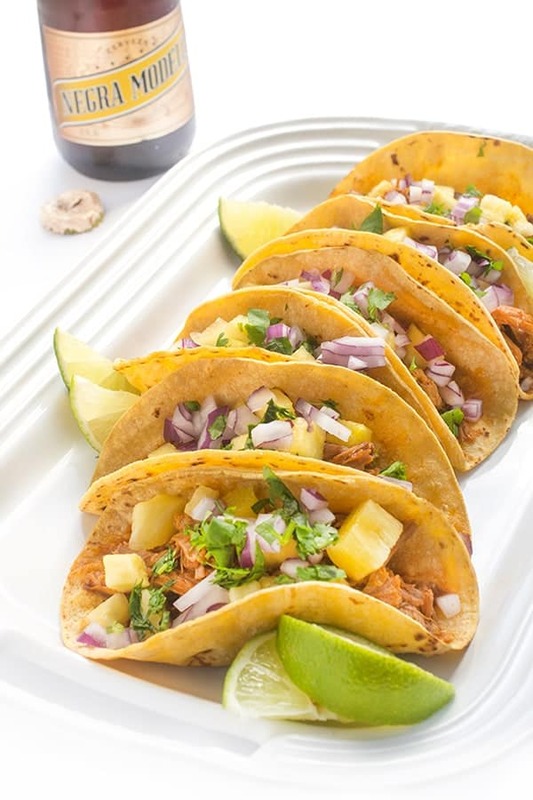 A Crock-Pot® Slow Cooker version of the Mexican classic, Tacos al Pastor is made with pork shoulder simmered in an aromatic mixture of pineapple, chiles, garlic and spices. There are two things this busy mama relies on regularly now that school is back in session: taco nights and my Crock-Pot® slow cooker! For real though, they are both life savers. As you know, I’m no stranger to slow cooking taco meat. From Gloria’s famous pork tacos to my Slow Cooker Beef Barbacoa, you name it, I’m slow cooking it and throwing it in a corn tortilla. In fact, over the last six years I’ve probably shared hundreds of slow cooker recipes and for good reason! 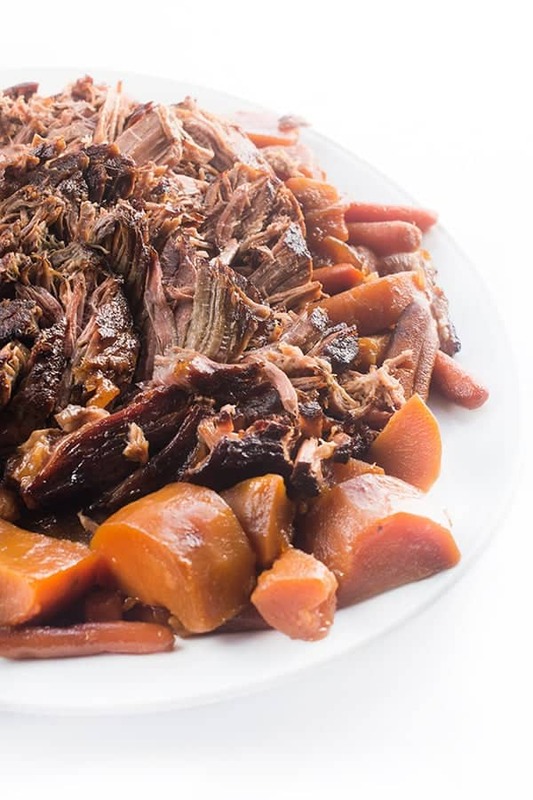 Slow cooking allows flavors to develop and the end result is always tender and juicy. 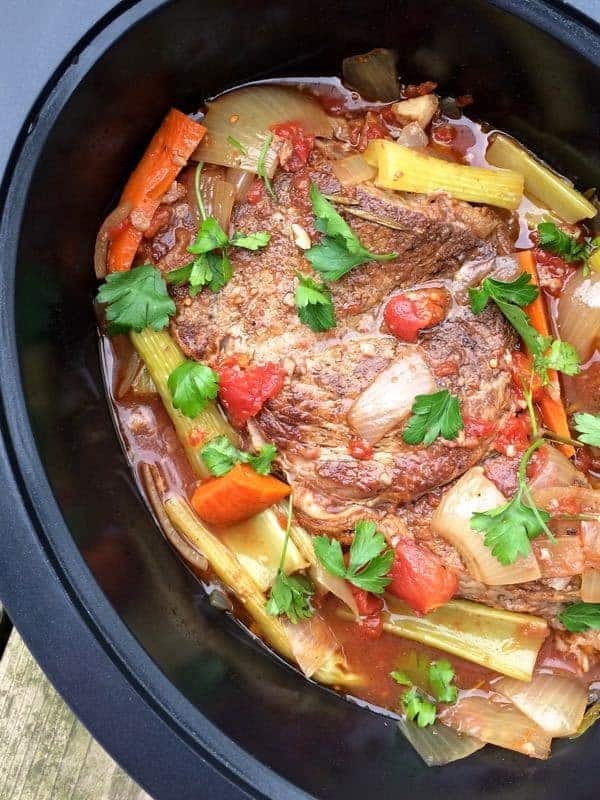 By keeping certain go-to kitchen appliances on hand like a Crock-Pot® Slow Cooker, I’m more likely to cook dinner at home which means I’ll save time, calories and money. Win win! For a sweet and savory spin on pork tacos, I decided to create a Crock-Pot® Slow Cooker version of the Mexican classic: Tacos al Pastor. 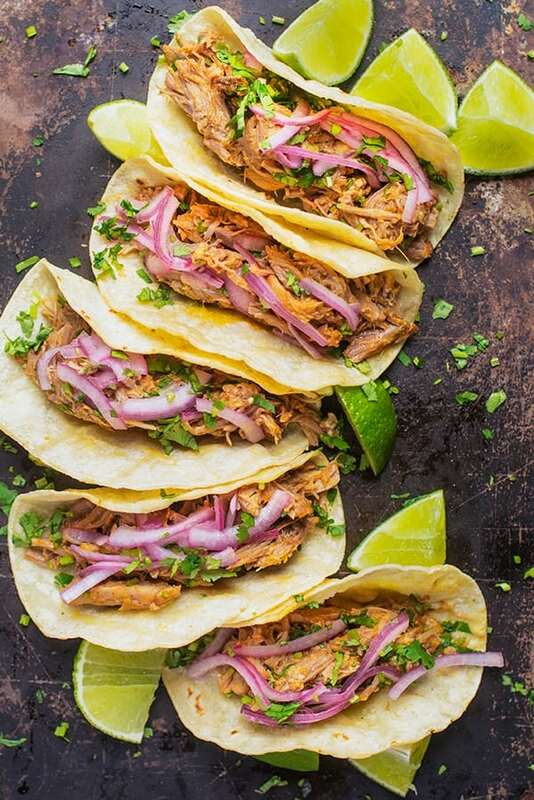 Boneless pork shoulder is slowly cooked in a puree of juicy pineapple, onions, garlic and chiles before being shredded and tossed into warmed corn tortillas. 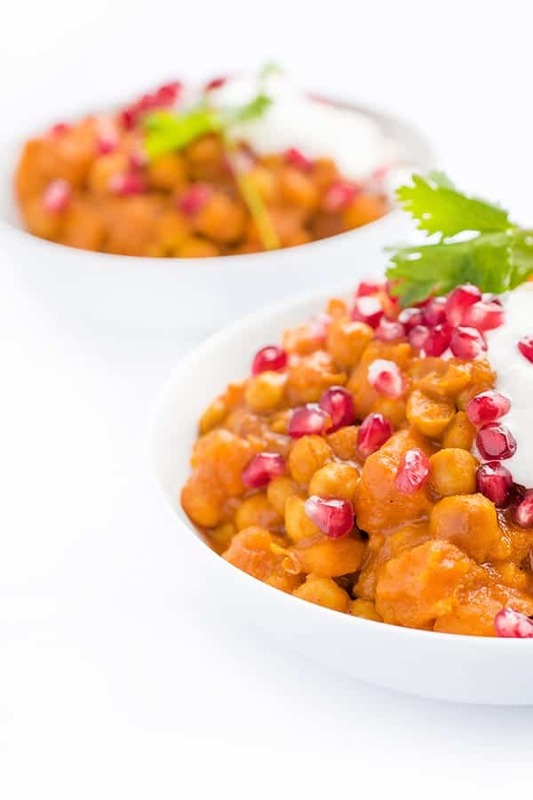 For a little freshness and crunch I like to serve them with minced red onion, fresh cilantro and minced pineapple. Lime juice perks up the dish and rounds out the sweet and slightly spicy pork perfectly. What are your favorite Crock-Pot® Slow Cooker recipes? I’m all ears now that school is back in session! 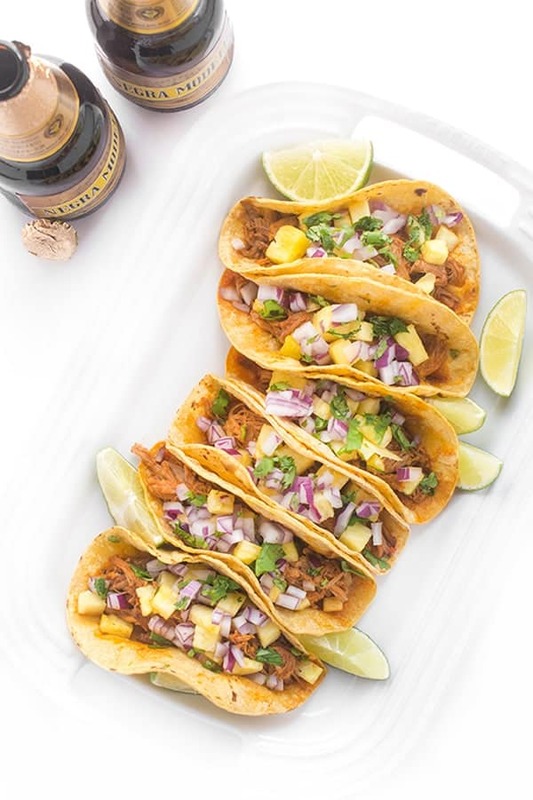 A slow cooker version of the Mexican classic, Tacos al Pastor is made with pork shoulder simmered in an aromatic mixture of pineapple, chiles, garlic and spices. Place pork shoulder in a Crock-Pot® slow cooker and top with 1 cup of the diced pineapple and the diced onion; set aside. Remove seeds and stems from dried chilis and place in a large bowl. Cover with boiling water and let steep to soften, about 15 minutes. Place softened chilis along with 1 cup of the reserved steeping liquid in a large food processor. Add the remaining 1 cup diced pineapple, quartered onion, lime juice, achiote paste, vinegar, garlic, cumin, oregano, salt and pepper. 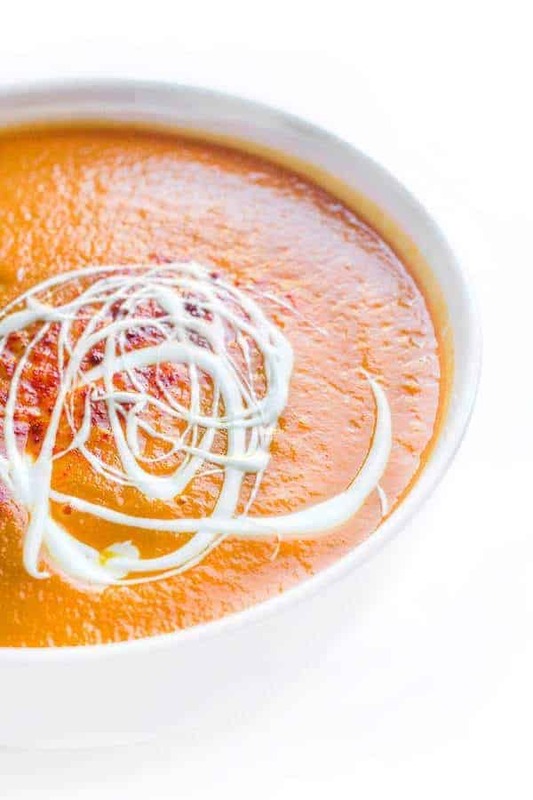 Puree on high for 60 seconds. Drain mixture over a fine mesh strainer placed directly on top of the pork shoulder in the slow cooker insert. Use a rubber spatula to press out all of the liquid and discard what's left in the strainer. Cook pork on high for 4 hours or low for 8 hours. To serve, shred pork with two forks discarding any large pieces of fat. Serve in warmed corn tortillas with cilantro, minced onion, minced pineapple and any other toppings of choice. Does that amount of pinapple make it sweet? My family loves these tacos but not when it’s super sweet. Should I hang the amount of pinapple or will it change it too much? I have a bag of dried Chili de Arbol that weighs 1 oz. It’s about the size of a sandwich baggie. There are probably 30-40 peppers in it. Your recipe calls for 6 oz of dried chiles. This seems like it would be an enormous amount of chilies, 100s of them. Is 6 ounces the correct amount? I’m thinking it would measure about 4 cups of dried chilies?? Since I don’t use dried chilies too often I want to make sure. Also, do you use fresh pineapple or can I use canned for the part that goes in the croc-pot? I would use fresh for the garnish. Great question! I would recommend using LARGER chilis like ancho, passilla, guajilla, etc. Six ounces is the correct amount by weight. :) Remember to remove the seeds to keep from being to spicy. As for the pineapple, canned totally works! Enjoy! Any suggestions on what to use in place of the dried chilies? What are you looking to accomplish? Flavor without heat? If so I would add a little smoked paprika? I can’t find dried chilies so just wondered what would be a good substitute. I’ll try that!! Thank you! Also, will it come out ok if I don’t strain the mixture before pouring over the meat? I don’t see where to use the achiote paste, does it go in the food processor with the chiles? Also, I bought ground achiote, any suggestions on how to make it a paste? Hi Erica – sorry about that just updated the recipe! Yes it goes in with the lime juice and chiles in the food processor. As for turning the ground achiote into a paste, I would just mix it with a little water. Yes it will turn out fine but the chili skins might be a little tough to chew. :) Enjoy! Ole! I want this for dinner! I hope you make it friend! Al Pastor tacos are my favvvvvvvvorites!!! 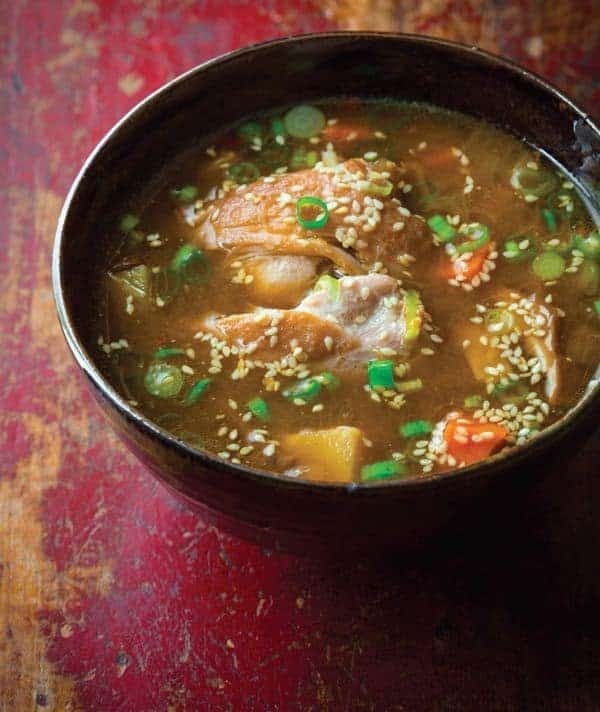 Any excuse to use the slow cooker, I’m game. These look so good! Right? I’m with you on that one! What do you recommend using in place of the red achiote paste? You know this was my first time using pineapple and it was definitely better than I expected!